Australia's King Gizzard and the Lizard Wizard cross off album number two of the promised set of five to be released this year with Murder of the Universe, a project that feels more akin to a radio program (think back to Orson Welles' panic-inducing take on H.G. Wells' "War of the Worlds" in 1938) than a record. The 21-track album is certainly the strangest and most draining release that King Gizzard have made to date; not as ambitious as the seamlessly looping Nonagon Infinity, or this year's earlier release Flying Microtonal Banana, but a feat nonetheless. It begins with a female narrator, Leah Senior, speaking frankly atop a sci-fi medley of sound. In fact, the narrator checks in with the listener on each and every tune, moving the story forward as it becomes more bizarre and disturbing. The first half of the record tells the tale of a man that longs to be fused with an "altered beast," which explains the tunes titled "Altered Beast" and "Alter Me." This is, obviously, not a good idea for the human in question, and it ends poorly, evoking another H.G. Wells work, "The Island of Dr. Moreau." The songs play out like this throughout: The female narrator sets the scene, frontman Stu Mackenzie sings a catchy line, the band respond in a frenzy and so on. It's hard to pinpoint what to focus on — the story being told, disturbing and detailed, or the madness of King Gizzard's music through it all. Certainly, though, it's amusing to hear Senior, with her sweet and slightly soft-spoken voice, say things like "I could pull you apart or cut you to pieces" and "My left hand is a mallet, and my right a fork. I will pull you apart like a butcher pulls pork." 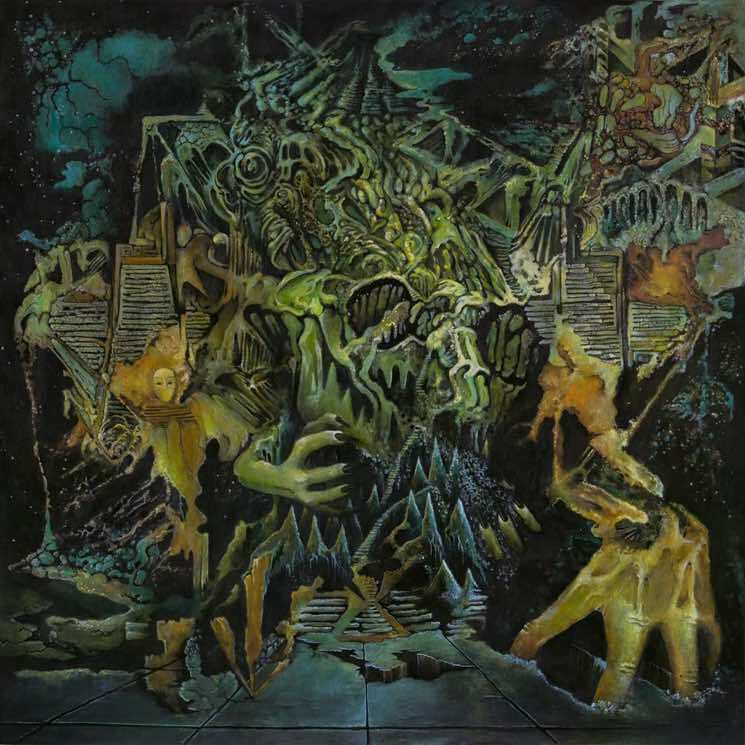 There are moments that harken to past King Gizzard songs ("Some Context" is simply the opening of Nonagon's "People Vultures"), but no track is as memorable or listenable as anything else that they've released. In fact, the songs don't (or can't) really exist on their own; Murder of the Universe feels more like a book on tape, a story set to music or a radio drama than a record. Not to mention how slightly tired most of the tracks seem. King Gizzard may have exhausted their high-octane, go-go-go stylings on this one; certain riffs echo past works, repeated motifs lose their oomph, Mackenzie's vocal whoops seem less exciting and the song writing structure is nothing particularly new. A shift in narrator and story occurs with "Welcome to an Altered Future," when an unenthused cyborg (named Han-Tyumi, voiced by a speech synthesis program) introduces the listener to the lugubrious future, where "we've changed our bodies into computers." What follows are cacophonous tunes that deal with the post-apocalyptic world, exploring themes of computer dominance and the imminent demise of humanity. That is, until Han-Tyumi addresses his disdain for being so non-human. He wants his life back, his desire back, his soul back. He strives for "two things that a cyborg can never do": to vomit and to die. "I want the perspiration, I want the nausea, I want to be sick," he says, as he describes in detail the kind of stomach sick he wishes to experience. The delightful tune "Vomit Coffin" ensues. Emetophobes beware. We won't spoil the ending here, but it suffices to say that Murder of the Universe gets weirder from there. And yet, despite being somewhat narratively compelling, it and, particularly, the instrumentation here veer more towards the monotonous. At times, one almost forgets that the band are playing in the background, as one keenly tries to make sense of the story at hand (one tends to distract from the other).